and company have received over the years. 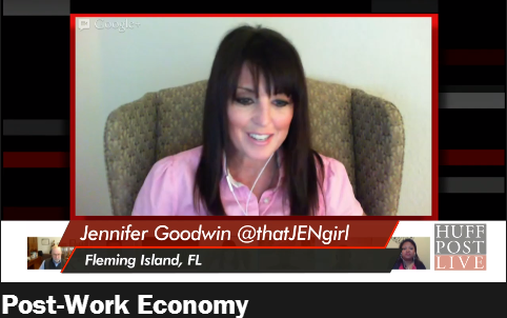 Listen to "Jennifer Goodwin - Modern Day Girl Friday Helping Veteran Small Business Owners" on Spreaker. In the last few years, working from home has gone from being a rarity to a reality. With advances in technology, more people are able to link to work from their home computers or laptops. And as employees continue to crave flexibility and yearn for a better work/life balance, more people are working from home for at least part of their workweek. Overwhelmed at the office? But not ready to hire new staff? A virtual assistant might be the solution. For small businesses that are drowning in paperwork or administrative tasks, the traditional choice has been to hire a part-time or full-time assistant, or else slog through unassisted. But in these work-from-home days of the Internet, there’s a third option: hiring a virtual assistant. What will 2008 hold for administrative professionals? With so many forces roiling the labor market – the trend toward just-in-time hiring, an economy squeezed by a credit crunch, technology that both destroys and creates jobs – it’s hard to say. But this perennial truth will hold: Great admins are hard to find, and they will be in great demand. Still, if you want to have maximum impact — by minimizing the impact of your office’s operations on the environment, that is — you’ve got to do more than just drop a few sheets of paper into the recycling bin every day. Here are five spheres of white-collar environmentalism to which you can pledge your efforts. Are SMB's Missing the Open Source Boat? Jennifer Goodwin is on a mission–and a budget that doesn’t go beyond five digits. Goodwin is gearing up to expand her company, internetGIRLfriday.com, which provides virtual business administrative support. Let our Media Team get you this kind of press too!